"We didn't need to be rescued." Bleecker Street has released the first trailer for Leave No Trace, the new film from Debra Granik (Winter's Bone), which first premiered at the Sundance Film Festival earlier this year to some rave reviews. Leave No Trace is a story about a father and daughter, living off the grid entirely in the forests of Portland, Oregon. It's a bit similar to Captain Fantastic from a few years ago, but a much more intimate and personal story of this father and his daughter. Ben Foster stars along with newcomer Thomasin Harcourt McKenzie, who is indeed a revelation. The full cast also includes Jeff Kober, Dale Dickey, Isaiah Stone, Dana Millican, and Ayanna Berkshire. This is also heading to the Cannes Film Festival next, and is one of the better films coming out of Sundance this year. Make sure it's on your radar. Will (Ben Foster) and his teenage daughter, Tom (Thomasin Harcourt McKenzie), have lived off the grid for years in the forests of Portland, Oregon. When their idyllic life is shattered, both are put into social services. After clashing with their new surroundings, Will and Tom set off on a harrowing journey back to their wild homeland. 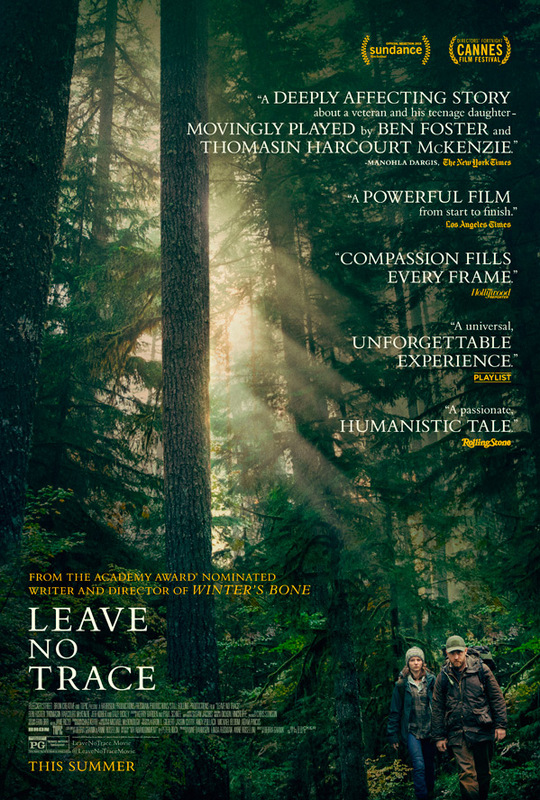 Leave No Trace is directed by American filmmaker Debra Granik, of the films Down to the Bone and Winter's Bone previously. The screenplay is written by Debra Granik and Anne Rosellini, adapted from Peter Rock's novel "My Abandonment". This initially premiered at the Sundance Film Festival earlier this year, and will play at the Cannes Film Festival this May in Director's Fortnight. Bleecker Street will release Granik's Leave No Trace in select theaters starting June 29th this summer. First impressions?